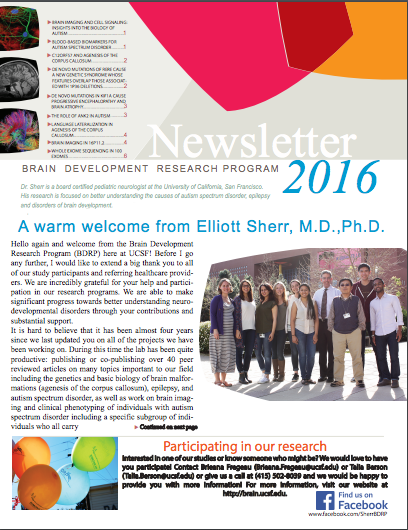 Can research participants meet Dr. Sherr? Current and potential research participants and their families who attend the NODCC’s annual conference are encouraged to schedule an appointment to meet with Dr. Sherr and the research team at that time. For more information, or to find out about other conferences that Dr. Sherr and his team may attend, please contact the research coordinator: Brieana Fregeau. To inquire about scheduling an appointment with Dr. Sherr in clinic, please contact the new patient coordinator, Raquel Gullien, by calling (415) 353-3682. Dr. Sherr also offers unofficial second opinions through an online service called 2nd.md. Please visit their website to learn more and view Dr. Sherr's profile. What happens to the MRI scans collected for the BDRP? Initially, the MRI scan is reviewed by a member of the research team to determine eligibility. If eligible, Dr. Sherr and Dr. Barkovich conduct a thorough review of each newly enrolled participant’s MRI scan. Please contact the study coordinators to receive Dr. Sherr’s unofficial interpretation of the MRI scan following the review session. Please remember that this information is strictly collected for research purposes and does not serve as a diagnostic clinical report or official interpretation. How is the blood draw coordinated? Participants are welcome to make an appointment with the research coordinator to have their blood drawn at UCSF. Participants also have the option of having their blood drawn remotely. In this case, a blood collection kit and shipping supplies will be sent to the participant’s home address. Participants can bring this kit to their local lab or doctor’s office to have their blood drawn. Participants are reimbursed up to $30 for the cost of their blood draw so long as they provide the research coordinator with a receipt. Are genetic test results provided to BDRP participants? Individualized genetic testing results are not provided to participants as part of the BDRP. The genetic analyses conducted are for research purposes only and do not possess clinical significance at this time. However, we intend to provide generalized, aggregated results from our research through scholarly publications that provide information regarding new discoveries of candidate and causative genes associated with ACC. We aim to share this information with our study participants annually through our newsletter. Please check in with the study coordinators to see if there are any new findings in the field. A list of relevant publications is included here. Can research participants who live in or plan to visit the San Francisco Bay Area participate in additional research? Research participants who reside in or plan to visit the San Francisco Bay Area are welcome to participate in the BDRP here at UCSF. This may include a physical examination, blood draw, and/or neuropsychological evaluation. Please contact us for more information. Healthy volunteers interested in participating in the Simons Variation in Individuals Project (SVIP) are encouraged to contact Polina Bukshpun (BukshpunP@neuropeds.ucsf.edu). Who needs to donate samples for the study? The individual(s) affected with a neurodevelopmental disorder, as well as both parents (if possible). Siblings are welcome to participate as well.